Beautifully presented, contemporary facilities with unique heritage and excellent service - Welcome to the perfect location for your next meeting or event! Based in the heart of London, on Belgrave Square itself and just 15 minutes walk from Buckingham Palace and the Royal Parks, the Belgravia Function Rooms boast the perfect combination of easy access, central location and peaceful privacy. With seven diverse and flexible event spaces that effortlessly blend contemporary style with Georgian period charm, plus two terraces and secluded courtyard gardens, it’s the perfect location for everything from meetings for 2 to conferences for 150. From boardroom meetings, presentations and AGMs to exhibitions, dinners and conferences, the Belgravia Function Rooms can be tailored to meet your requirements. Our boardrooms feature elegant, quality furnishings but the flexible spaces can be transformed for theatre or cabaret style seating, or cleared for receptions and exhibitions. The air-conditioned Auditorium comfortably accommodates 150 fully equipped with AV including Bose surround sound, making it perfect for presentations, lectures, award ceremonies and screenings. Auditorium bookings include the Garden Room as an ideal break-out or refreshments area and use of a dedicated entrance hallway from the square for registration. In fine weather, both the Council and Leverhulme Rooms have direct access to outdoor terraces whilst the Auditorium and Garden Room have access to the courtyard gardens, offering a breath of fresh air for your delegates and even the option for outdoor drinks receptions and catering. Hire one room or several as a suite. Here at SCI and the Belgravia Function Rooms we are a small but friendly team and pride ourselves on offering you excellent service and value from initial enquiry to event. We are always on hand to discuss your requirements so you can be confident that your event will be a success. Whether it’s a working lunch or a three course dinner, a conference call or videocasting your event across the country we will work with you and our excellent suppliers to ensure that your event is delivered to the highest standards. 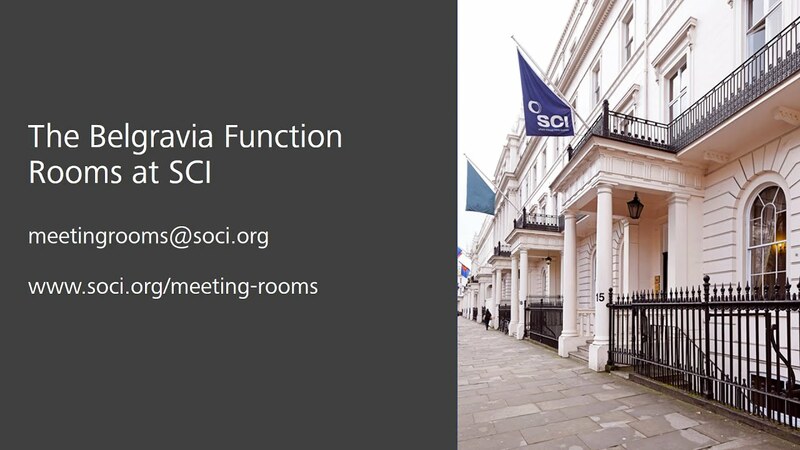 The Belgravia Function Rooms are based at the home of SCI, a not-for-profit membership organisation that invests all profit into the promotion of innovation and education to advance the commercial application of chemistry related sciences into business. Established by Royal Charter in 1881, and in residence at 14/15 Belgrave Square since 1955, the Society of Chemical Industry was founded by a prominent group of forward thinking scientists, inventors and business people, many of whom set up major businesses that are recognised today. A venue with a difference; your delegates can enjoy your event surrounded by the history and prestige of such an organisation, whilst supporting the future of the chemical industries that influence all aspects of modern life. Belgrave Square, London SW1, has excellent transport links and can be reached on foot from Hyde Park Corner, Knightsbridge and Green Park tube stations and Victoria tube and rail station within 8-15 minutes. All major London stations (incl. King's Cross and St. Pancras International, Euston, Paddington, London Waterloo, London Bridge, Charing Cross and Liverpool Street) can be reached within 30 minutes and London City, Heathrow and Gatwick airports within an hour (by train). Belgrave Function Room booking offer: book 9 rooms get 1 free! Bookings before 31 December 2019, subject to SCI T&Cs. Contact clarice.williams@soci.org/ +44 (0)207 598 1587 for more information or to book. The event was a huge success, the space is fantastic and hopefully we will be back for more events. Thank you so much for accommodating us at such short notice. Indeed several of the members commented on the great venue! Will almost certainly use again. Many thanks again for all your help and advice. We had a great evening and will no doubt talk to you again when we are organising our next event. The whole set up was excellent - room was lovely and the staff were great and very helpful. Thank you all so much! exceedingly efficient, friendly and helpful throughout. Thank you!